About an hour ago, the pre-wedding gala dinner at the palais and the chambre de deputés started. On the picture above you can see Princess Stéphanie, Hereditary Grand Duke Guillaume and Grand Duchess Maria Teresa toasting each other after the Grand Duke pronounced his speech. I was able to catch some of the guests arriving on a livestream. Prince Félix, Prince Louis and Prince Sébastien arrived together, sans princesses Alexandra and Tessy whom I couldn't spot. Princess Marie-Astrid and husband Archduke Carl-Christian arrived together. The princesses wore a red dress and Joséphine-Charlotte's Van Cleef and Arpels Emerald Peacock and Diamond Convertible Tiara (just trying to squeeze in all the details that I know). Princess Margaretha also wore a red dress together with the aquamarine bandeau tiara that once belonged to her late mother. Diane, the wife of Prince Jean, also opted for a red dress together with the smaller version of the Diamond Art Deco tiara that belongs to Princess Sibilla. As you can see above, Princess Stéphanie wore the bigger of the two diamond floral tiaras that was worn by the sisters of Grand Duke Jean at their weddings. Grand Duchess Maria Teresa opted for the convertible Chaumet tiara. 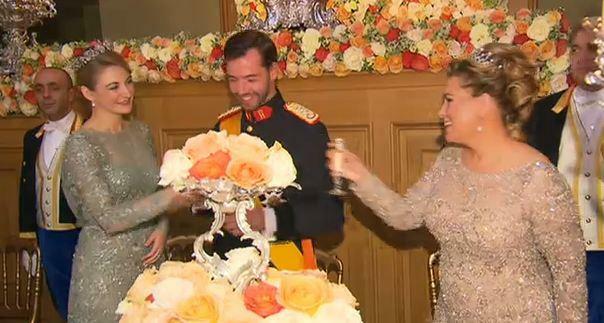 To my untrained eyes it looks as if both Maria Teresa and Stéphanie chose Elie Saab gowns. First pictures can be found at Belga and PPE.